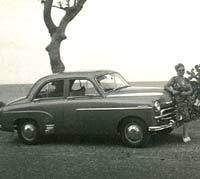 A Vauxhall Velox E-Series of 1955, plus a Cresta. Homepage. 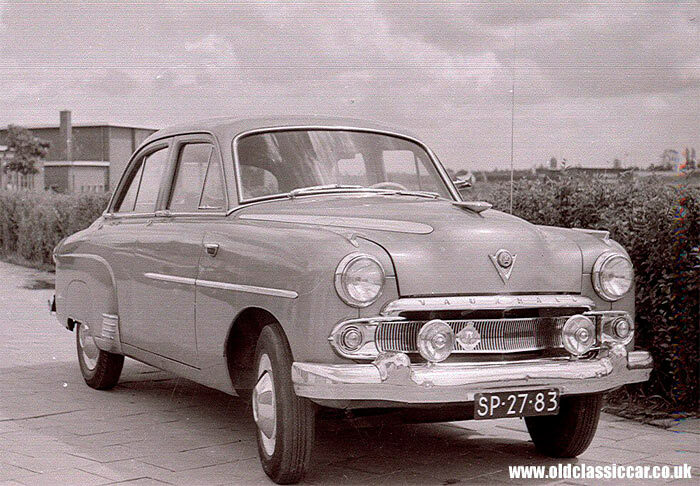 This page: A selection of E Series Vauxhall photos, starting with a 1955 Vauxhall Velox photographed in The Netherlands..
Firstly, an E-Series Vauxhall saloon from the mid 1950s, photographed by Leo in Utrecht, 1957. It shows the car belonging to his friend's father, an accountant. It was built in June 1955, and was finished in a light green metallic colour. This Velox has had extra lamps fitted on the front, making it look more like the plusher Cresta of the same era, both sharing the six cylinder powerplant. Apparently the car cost approximately 8000dfl (780 GBP) when new. There were three models in the E-Series Vauxhall line-up. Most basic was the four cylinder Vauxhall Wyvern, with less chrome ornamentation differentiating it from the six cylinder cars. 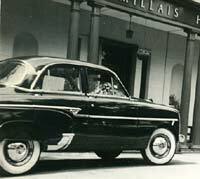 Next was the Velox, as shown here, and most luxurious of the lot was the Cresta, benefiting as it did from a leather trim option, a heater, cigar lighter, dashboard clock and numerious other improvements to specification. Another photo of a Wyvern, plus a shot of the Vauxhall production line, can be seen here. 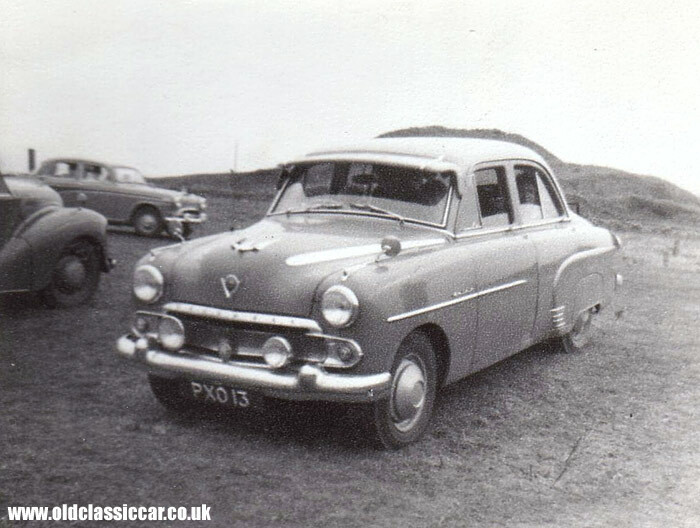 Brian sent me a photo of an E-Series Vauxhall Cresta that belonged to his father, seen here in 1958: "The picture was taken at Woolacombe, Devon in 1958. He had loaned it to me to take my girlfriend's (now wife) family on holiday. The Cresta was the third in line following a Wyvern and a Velox, both E series with the wide mouth front". For comparison, photos of the later PA Cresta/Velox can be found here, while a PC Cresta of the 1960s can be seen here. 3. Vauxhall Wyvern EIX 1953. 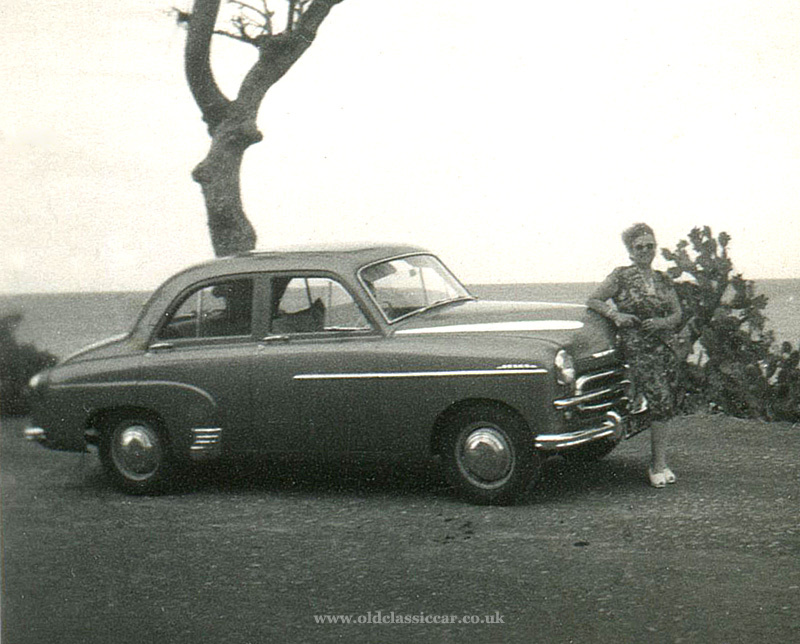 David B sent in the next two photographs, both are images sent out by Vauxhall's PR Department during the 1950s. The first car, LBM 219, is a circa 1953 Vauxhall Wyvern EIX series. 4. 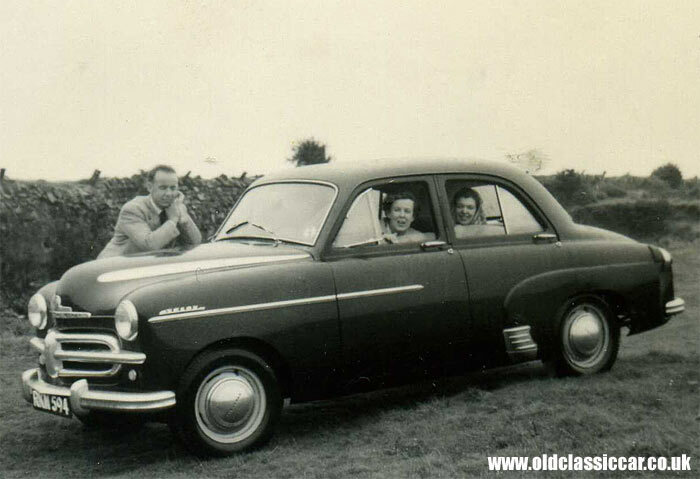 Vauxhall Velox EIPV 1953. LMJ 782 is an EIPV-type Velox, also of 1953. Note the nearside spotlamp, was that ever a standard fitment on a new Velox? or perhaps an extra-cost option from Vauxhall? 5. 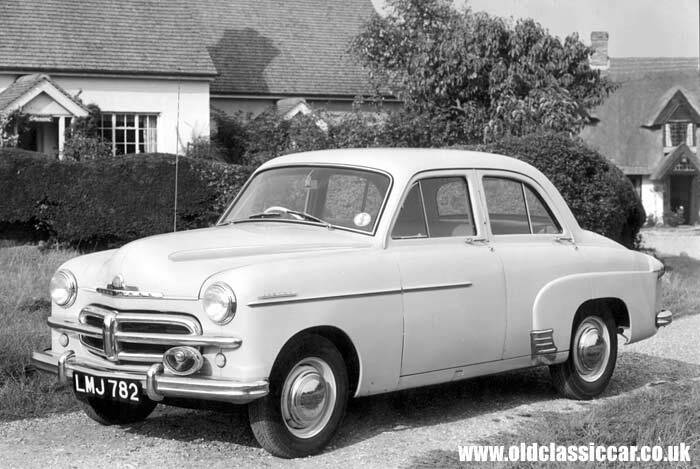 Vauxhall Velox reg. RKM 594. Three photographs now, all showing the same E-Series Velox, reg. no. RKM 594, a Kent number. 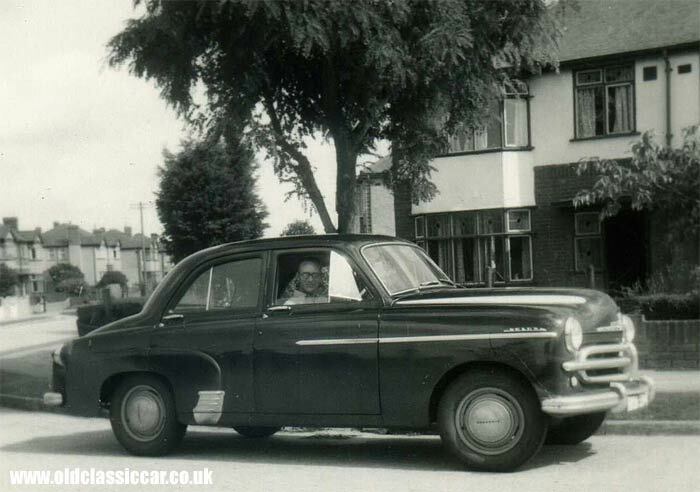 The first view shows the proud owner sat behind the wheel of his 1950s' Vauxhall, in a typical suburban setting. Ah bliss, not a wheelie bin or satellite dish anywhere!! Photos 2 & 3 shows the same car parked away from the road. Rear views of old cars are much less easy to find than head-on or side shots, so it's handy to have a selection of images from all around this example. 6. Vauxhall on a camping trip. 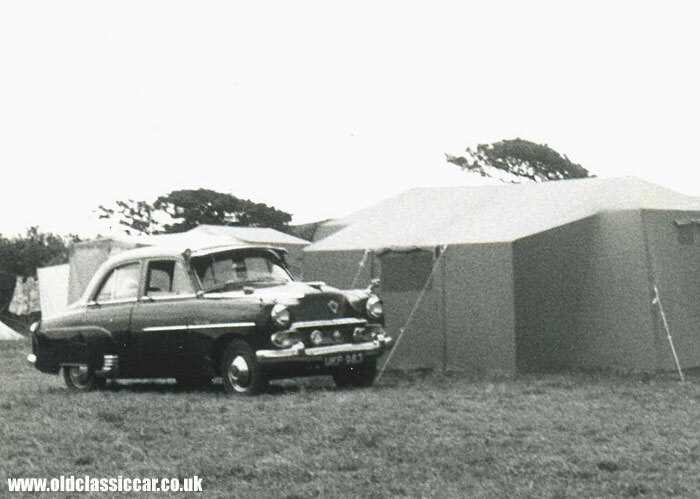 Next up, a dark-coloured E Series Vauxhall (probably a Cresta) snapped on a camping holiday, parked alongside some tents. The registration is blurred but looks to be UKP 983, a Kent-area number used from April 1955 onwards. The owner was a fan of bolt-on accessories - wing mirrors, a screen visor, and a small lamp fitted to the screen pillar, all look to have been added on to this particular Vauxhall. 7. A Cresta outside a hotel. Glistening while parked outside a smart-looking hotel is this next classic Vauxhall, another example of E-Series Cresta - most likely an EIPC variant of 1955 or 1956. Trim alterations made to the E-Series between the different models and build years are numerous to say the least, but the style of side trim on this car, plus the semi-enclosed rear wheel spats, suggest a date of '55 or thereabouts. 8. A classic Velox EIPV. 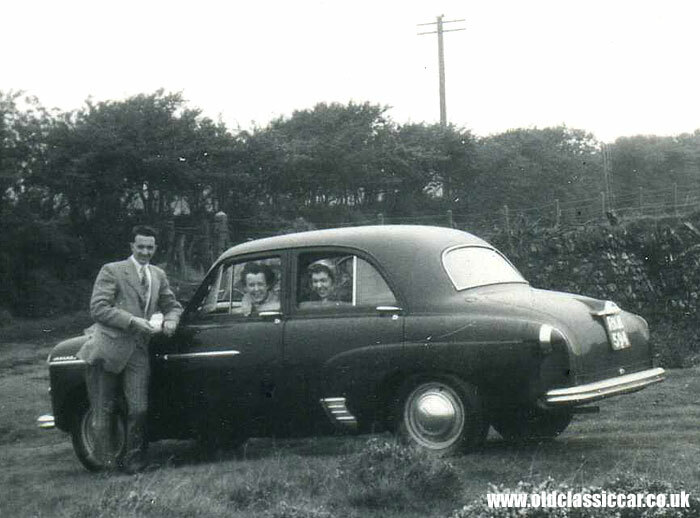 Another example of a 1950's six-cylinder Vauxhall Velox (EIPV type I think) features in the following snapshot, no more details are known. 9. 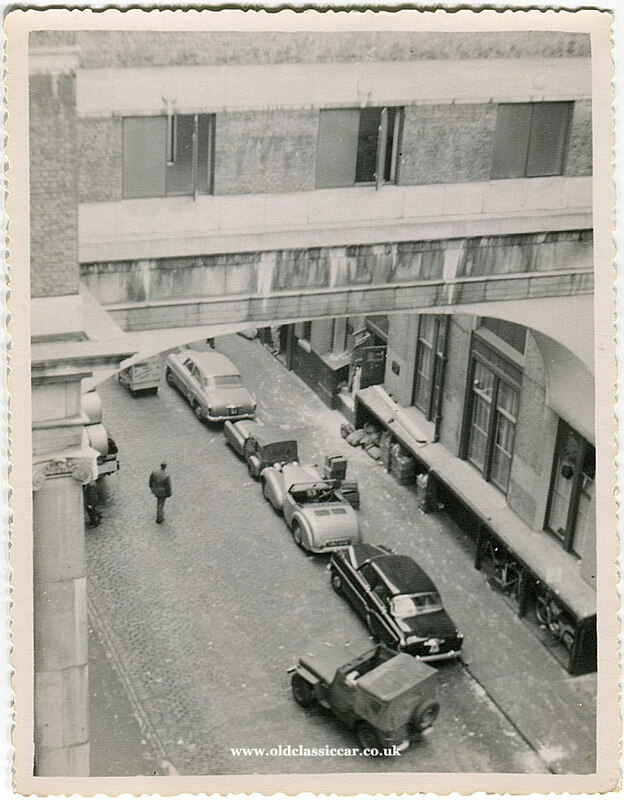 A birds-eye view of two Veloxes, and other cars. I'd love to know where this photo was taken. It's a British scene, and the buildings have age to them, also the structure that bridges both sides of the road is quite distinctive which may help to pin down the location for this birds-eye view of the road below. 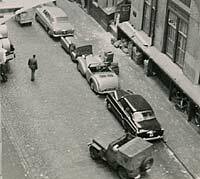 A number of vehicles are parked up, while an American Jeep pulls out from its parking space, gingerly I hope given that there's a gent walking across the road. Note the Jeep's roof, which is enclosed at the rear but open over the front seat occupants. 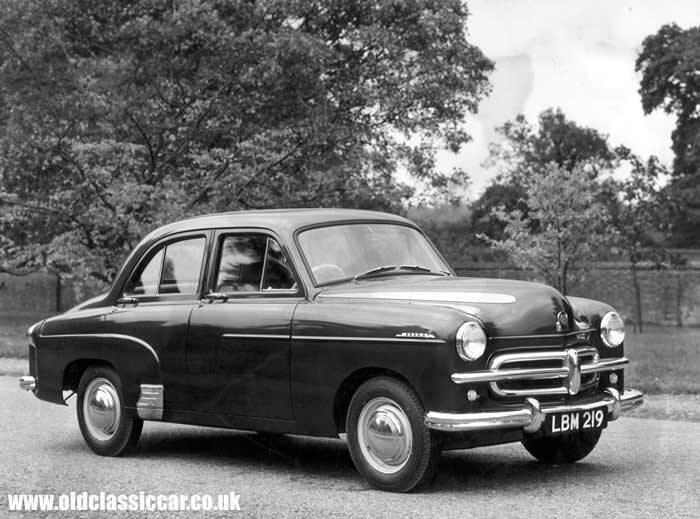 Close to the Jeep is a dark-coloured Vauxhall Velox, distinguished by the distinctive side trim that this model wore for a time during its production run. 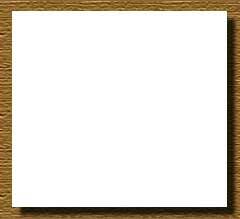 A light-coloured example can also be seen, further away. Between the two Vauxhalls are a Triumph Roadster and a Bond three-wheeler, both of which offered open-top motoring to their owners but were otherwise totally different motoring prospects. There appears to be a small delivery vehicle in the road close to the second Velox. Note the roofed shelter visible to the right, in which a bicycle and a small-engined motorcycle can be seen stored. Is that the rear of a flatbed lorry just visible to the left, loaded with rolls of paper perhaps? The boxes visible on the pavement, and sacks of ??? spilling onto the pavement, suggest that the area was at least semi-industrial. Return to Old Vehicle Photos Page 7. Something else that might be of interest, is a page that looks at a magazine produced by the factory for the general public, namely The Vauxhall Motorist (1950-1955 issues). 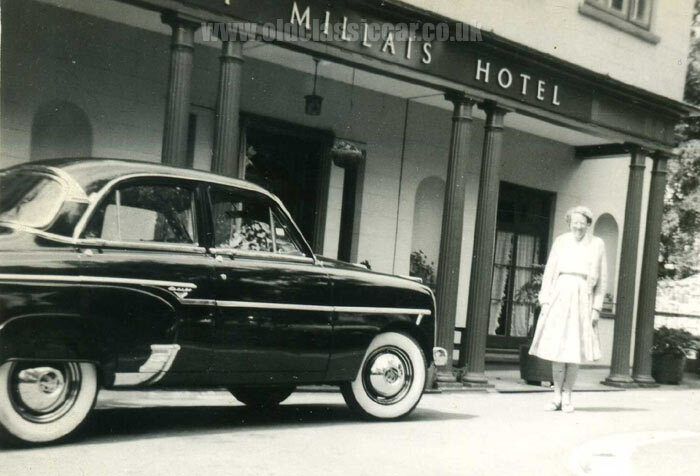 Two rare photos of the very unusual Martin Walter Dormobile conversion of a Vauxhall Velox saloon, are on this page, also in the image archive section of the site.